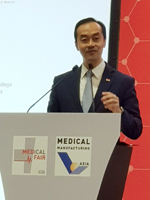 Singapore's medtech manufacturing sector is important for the country, having generated S$11.3 billion in 2016, said Dr Koh Poh Koon, Senior Minister of State for Trade & Industry, at the opening of the Medical Fair Asia show recently in Singapore. This was affirmed by Philip Kia, Deputy Chairman of Singapore Precision Engineering and Technology Association (Speta), who said that the output of Singapore's medtech sector has tripled from S$1.5 billion to S$5.5 billion since 2000. As Asia develops, the medtech sector will play an increasingly important role, with the Asian sector expected to grow 8% year-on-year, and projected to overtake the EU as the second largest market globally by 2020. Singapore is home to more than 60 multinational medtech companies undertaking a range of activities from regional headquarters and manufacturing to R&D, Kia said, adding that there are 25 R&D centres and a local pool of 220 medtech start-ups and SMEs. "In fact, local precision engineering companies spent S$313 million, or 50% more on R&D in 2016, compared to the previous year," he stipulated. Dr Koh went on to say that medtech companies in Singapore produce a wide array of products, ranging from contact lenses and pacemakers to life science tools and diagnostics equipment. "In the area of scientific instrument manufacturing, we have established strong leadership positions in key products such as next-generation sequencing platforms and mass spectrometers, with Singapore manufacturing over 60% of the world’s microarrays and one third of the world’s thermal cyclers and mass spectrometers." Messe Düsseldorf Asia and Speta have been organising the two exhibitions, Medical Fair Asia and Medical Manufacturing Asia. This year’s event, which includes a strong international showcase from 62 countries in total, includes first-time participation from Belgium, Brazil, Denmark, EU, Iran, the Philippines, Qatar, Russia and Spain. Gernot Ringling, Managing Director of Messe Düsseldorf Asia, said this year's event is the largest instalment to date. "It has more than 1,000 exhibitors and 23 country national pavilions. There is also a Start-up Park, a dedicated showcase featuring young companies with prototypes and the Future for Health, a forward looking showcase highlighting innovations in mHealth, Artificial Intelligence, Smart Date and IoT solutions." The show, held at Marina Bay Sands, Singapore, will run from 29th - 31st August.